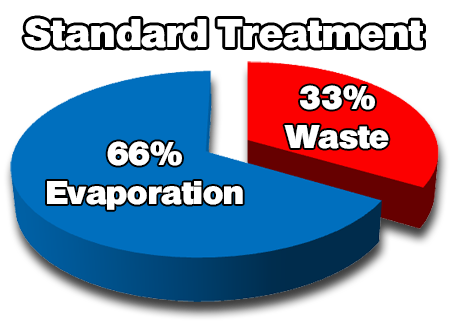 Standard cooling tower water treatment programs require 33% to 50% waste water discharge in order to prevent scale formation. Even in a relatively small cooling tower, this can add up to hundreds of thousands of gallons of fresh water wasted annually. 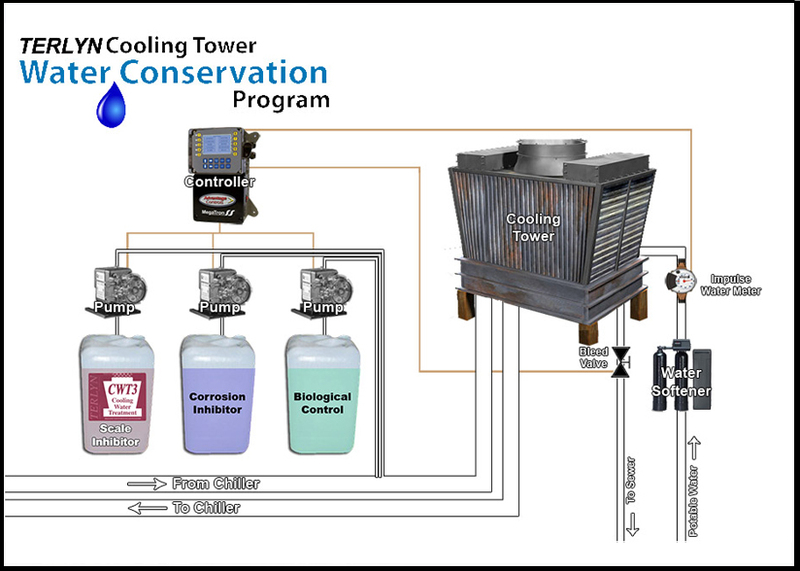 With water costs on the rise and severe drought in some areas of the country, now is the perfect time to upgrade your water-wasteful cooling tower water treatment program to the Terlyn Cooling Tower Water Conservation Program. Industry uses a tremendous amount of water for many different applications, one of which is for cooling. Water is a very efficient media when used to collect and dissipate heat. Unfortunately, one of the systems commonly used to perform these tasks (cooling towers) can be quite inefficient. Because of poor water management, a ridiculous amount of chemical-laden water is being bled-off, or dumped every day. Even a relatively small cooling tower can bleed in excess of one million gallons of water every year. Until recently, dumping water through forced bleed-off was a necessary evil that no one liked, but could do nothing about. Fortunately, times have changed and technology now offers a solution. That solution is the TERLYN Cooling Tower Water Conservation Program. Bleed-Off is an essential part of cooling tower operation. Minimizing this water waste while maintaining complete system integrity is our mission. Our system is very similar to standard water treatment, only we reduce water waste by up to 90%! Over 10 years’ worth of case studies with dramatic, documented water savings.